When it comes to design there are so many things that I love ~ a cool font, printed fabrics and paper, the unique shape of a piece of furniture or the architectural design of a heritage building. I found this cool idea for a super easy DIY subway art project on Pinterest a few years ago. I thought it made a brilliant baby gift, but also knew the idea could be used in many other cool ways. I loved how she used different fonts and alignment to get the overall look. Click the image to visit the original post and find the complete tutorial. This project works best using Powerpoint or Keynote because both programs allow you to really play around with the text within the given document. Basically, each tag line is made in a different text box that is formatted with a specific font, colour and size to fit with the overall look of the sign. I adjusted the font direction to create the vertical “chores” tag. When I completed the sign in the program, I simply printed it on a full 8 1/2″ by 11″ cardstock paper using my coloured printer. I cut a board the same size as the paper and painted it white. I drilled a hole in the back,so that it could be hung after completion. I then applied a thin layer of podge and carefully placed the paper on top. I smoothed out any bubbles by gently pressing a dry cloth across the surface. I wanted to distress mine a bit, so I sanded the paper edges and letters very gently and added a little brown ink to the edges and some areas of the surface. Finally, I put on a coat or two of Modge Podge to finish off the project. This worked really well, but I must admit that the moisture in the bathroom is not the best place for a project like this. Over time, it has warped/puckered slightly. If you want to do this project, I encourage you to click on the image above and get the complete step by step tutorial. This sign was made for my children’s upstairs bathroom when I did a bathroom make-over a few years ago. 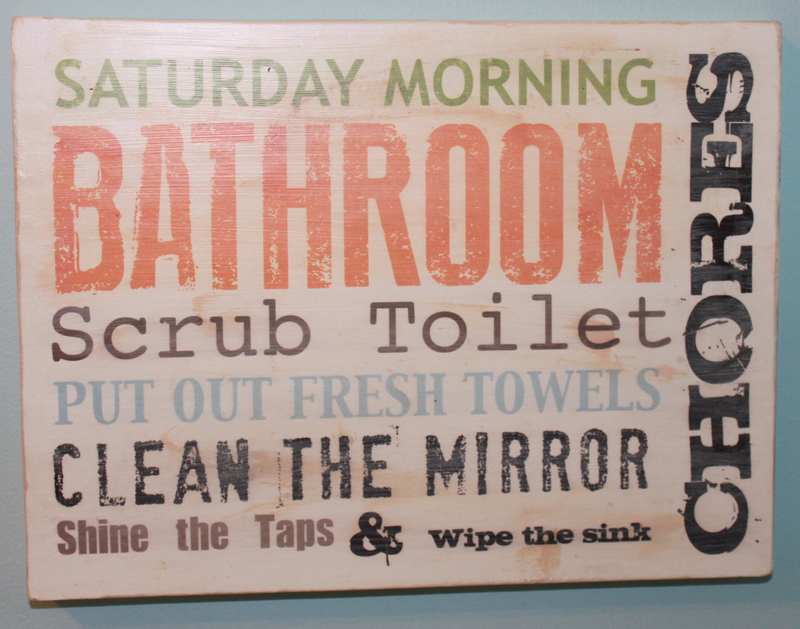 I love that it serves a dual purpose ~ bathroom art and chore list all in one. Posted on September 13, 2013 by Cindy Roy •	This entry was posted in DIY and Upcycling and tagged bathroom art, bathroom chores, DIY projects, DIY signs, DIY subway art, make your own signs, subway art. Bookmark the permalink. ← Pillow Talk: What’s in Your Pillow?